KINGSFORD — Wallace J. “Doc” Menghini, 95, of Kingsford, passed away on Thursday, Feb. 2, 2017, at Evergreen Heights Assisted Living in Kingsford. He was born Jan. 5, 1922, in Norway, son of the late Floriano and Edith (Enama) Menghini. Wally graduated from Norway High School in 1941, and was a lifelong resident of the area. He was a United States Navy Veteran of World War II serving in the European and Pacific Theater’s. He had the privilege of going on the U.P. Honor Flight in May of 2016 with his daughter, Mary. Wally married Gwendolyn Baker on May 27, 1950, at the First Presbyterian Church in Iron Mountain. He worked at the Niagara Paper Mill as an equipment operator for 33 years, retiring in 1983. Wally was a member of the First Presbyterian Church in Kingsford. He was an avid outdoorsman and enjoyed hunting, fishing, camping and walking. He was fond of animals, especially his daughter, Mary’s dogs, Ginger and Dimples. Wally loved spending time with family and following his grandchildrens sporting events. He is survived by his wife of 66 years, Gwen; a son, Paul (Tammy) Menghini of Roscommon, Mich.; a daughter, Mary (Roger) Skoglund of Norway; six grandchildren, Ryan Menghini, Kendra Menghini, Heather (Ronnie) Hebert, Kristine (Kervin) Torres, Roxanne (Keith) Poillion and Connie Skoglund; eight great-grandchildren, Skylar, Brooklyn, Trenton, Taylor, Gyanna, Evan, Wyatt and Riley; and several nieces and nephews. Wally was preceded in death by seven brothers, Rudolph, Ernest, Herman, August, Floyd, Clarence and Robert Menghini and a sister, Ann Zeni. Visitation will be held on Monday from 10 a.m. to noon at the First Presbyterian Church in Kingsford. Memorial services will follow on Monday at noon at the church. Rev. Michael March will officiate. The Uren-Cooper-Johnson American Legion Post 50 will conduct Military Honors following the memorial service. Burial will be in Quinnesec Cemetery. 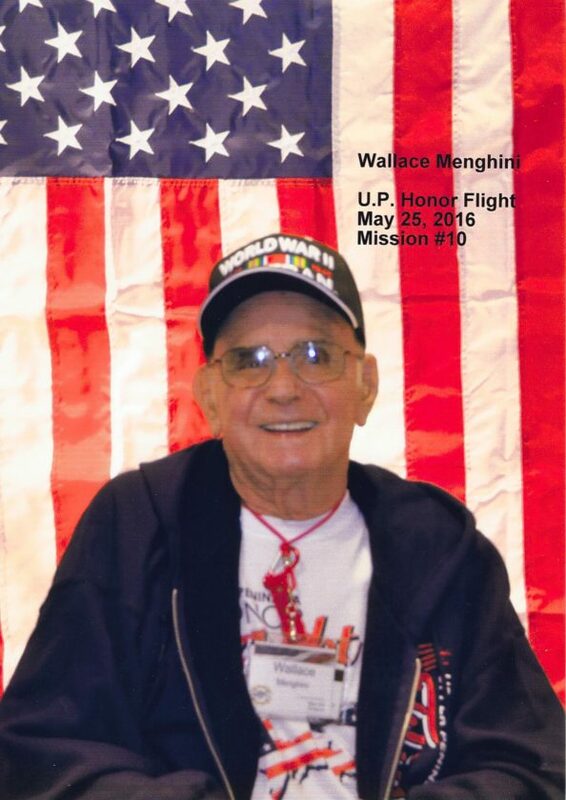 Condolences may be expressed to the family of Wally Menghini online at www.ernashfuneralhomes.com.